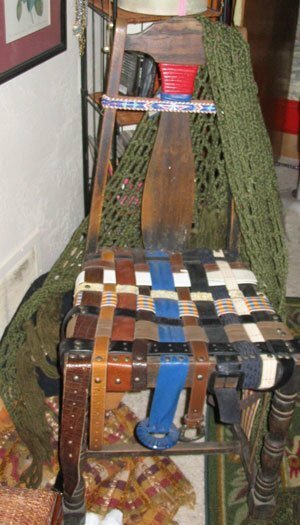 Make a chair seat from old belts! I used as many leather belts as I got after my mom died a couple years ago and wove them onto where the seat was missing from this chair. I secured each end of the belt onto the wood with upholstery tacks. Very nice! I think your chair is gorgeous because its so unique. My daughter has a pink room. Pink ceiling, pink walls, pink comforter, pink hanging beads.........having a chair decorated like this would really add a good contrast, yet blend in. Thanks for a very cool idea! And I thought it was going to be a 'caning' chair. Oops, it 'is' a caning project. I guess you could still do this on a regular chair too. I absolutely love this, especially the sentimental part. I love this idea! I have a rustic livingroom and some old chairs. I have already started my search for old tooled belts. Thanks for sharing.